Minot, North Dakota — As the Winter Olympics wrap up in Pyeongchang, South Korea, Olympic fever has spread to North Dakota, as International Olympic Committee officials announced they are considering the Flickertail State to be the permanent home of the winter games, according to multiple sources. The Olympic Games have faced growing criticism as host nations often spend billions of dollars to build facilities and infrastructure that is utilized for a short period of time, and often go to waste after the games are over. Finding a permanent home for the Winter Olympics would alleviate unnecessary costs. 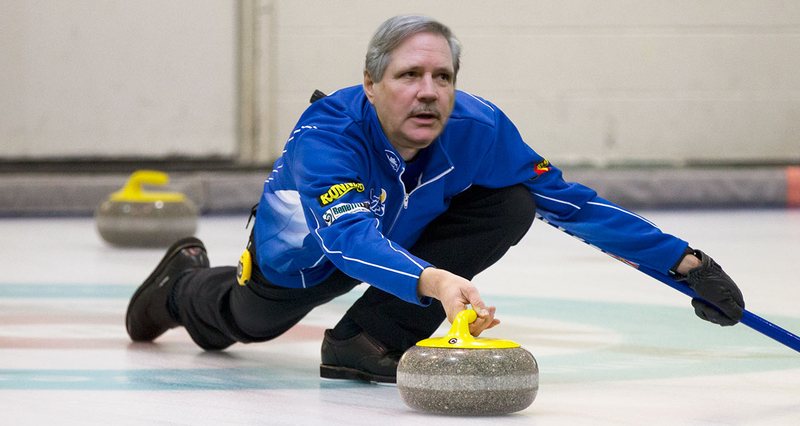 North Dakota, according to officials, would be an ideal home for future winter Olympics. Multiple locations are being considered for the Winter Olympic village with Minot as the front-runner. 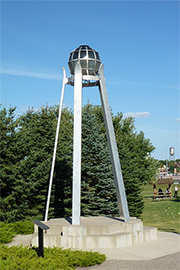 The Sondre Norheim Eternal Flame in Minot, ND. The torch Eriksson refers to is the Sondre Norheim Eternal Flame, built to commemorate Sondre Norheim, the pioneer and father of modern-day skiing. Lit on December 4, 1993 in Minot, the flame originates from the fireplace of Sondre Norheim’s birthplace in Norway. The flame was transported to Minot by North Dakota Governor Edward Schafer on a Norsk Hostfest sponsored trip. The torch is housed in a globe, which represents the many contributions to the sport of skiing that Norheim gave the world, and is elevated above five aluminum skiis, symbolic of the five Scandinavian countries. “There’d be no finer Olympic Torch than the Sondre Norheim flame in Minot,” says Eriksson. 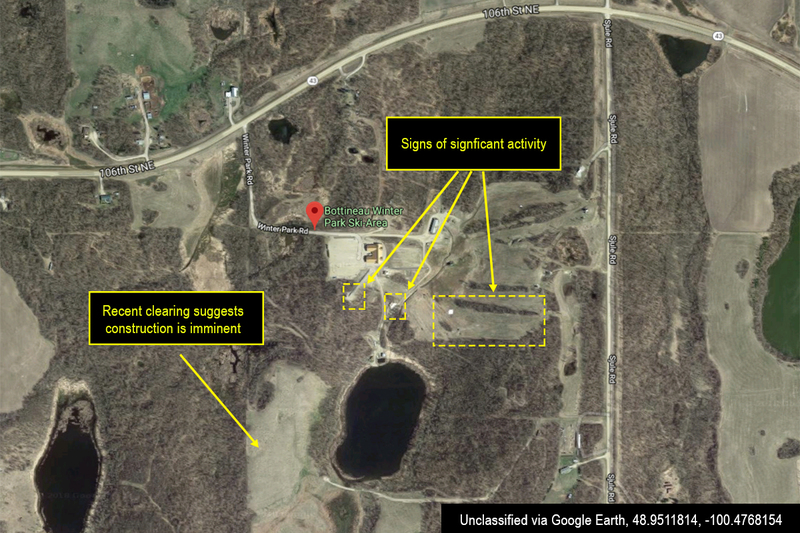 While no official sites in North Dakota have been confirmed to host future winter events, satellite images obtained by the Flickertail Times show significant activity at least one site at Bottineau Winter Park, about 88 miles from Minot near the US/Canadian border. Signs of significant activity including recent clearings suggest the Bottineau Winter Park could be getting ready to build future Winter Olympic Game venues, with plenty of room for North Dakota’s first bobsled track, or perhaps additional alpine skiing courses. North Dakota has additional infrastructure that could be used for hosting additional games. With no shortage of ice arenas in the region, the hockey could find a home in Ralph Engelstad Arena in Grand Forks or the Scheels Sports Arena in Fargo. Figure skating and speed skating could also be easily accommodated in North Dakota at multiple venues. Lars Fjord, a senior International Olympic Committee diplomat, says hosting the games in Minot and Bottineau, near the International Peace Gardens, would be a strong symbolic gesture. It should be noted that the International Peace Gardens recently underwent renovations. No word on if the construction was related to rumors that the winter games could be coming to North Dakota. Satellite imagery shows significant activity near Bottineau Winter Park, a sign officials could be getting ready for a major sporting event such as the Winter Olympics. When asked to comment about the Winter Games coming to Minot, Governor Doug Burgum laughed, but didn’t dismiss the rumor. “Well you know what they say in Minot — ‘Only the Best Come North”, so don’t be surprised if you hear more about this soon,” said Burgum. While no official announcement has been made, city officials in the Magic City are excited at the prospect of North Dakota hosting the winter games. Some Minot residents are already placing bets on who, or what the official mascot of the games will be, while others have voiced concern over security if the games do come to the Flickertail State. In addition to its close proximity to Canada, Minot is an ideal location from a defense perspective, according to security experts. Minot is just minutes from one of the world’s largest nuclear arsenals, including nuclear-capable B-52 bombers housed at the Minot Air Force Base, and multiple LGM-30 Minuteman ICBMs, scattered across the northern prairie. If Minot’s location isn’t enough to convince skeptics that the winter games could be coming to North Dakota, consider that construction was recently completed at the Minot International Airport, making it one of the largest airfields in the state. *The Flickertail Times is a satirical news blog focusing on all things North Dakotan. Feedback? We’d love to hear it! Send us anything and everything to: editor@flickertailtimes.com.